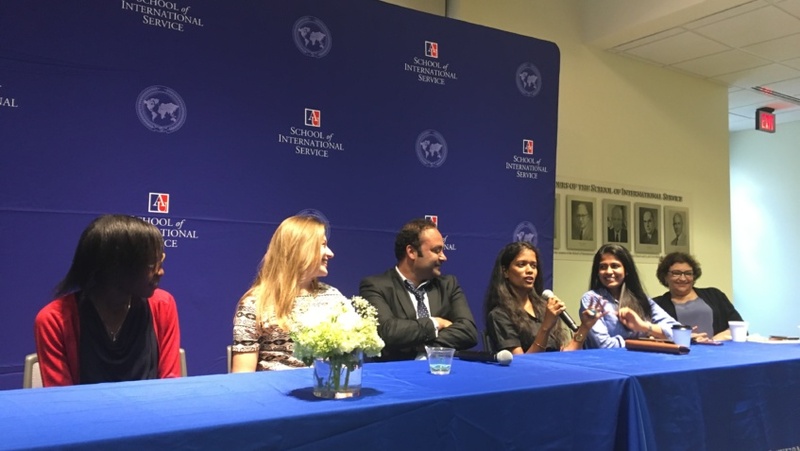 Seven Alfred Friendly and Daniel Pearl Fellows spoke with students at American University in Washington, D.C. on Sept. 7 about how they handled six months of living in the U.S., working in major newsrooms, and learning investigative journalism skills on a college campus. Fellowship program trainer Gary Weaver, who helped journalists from more than 80 different countries, died peacefully on March 11, 2017. Above, Weaver speaks with former fellows in 2014. The event honored the late Gary Weaver, who founded the Intercultural and International Communication Program at American University. 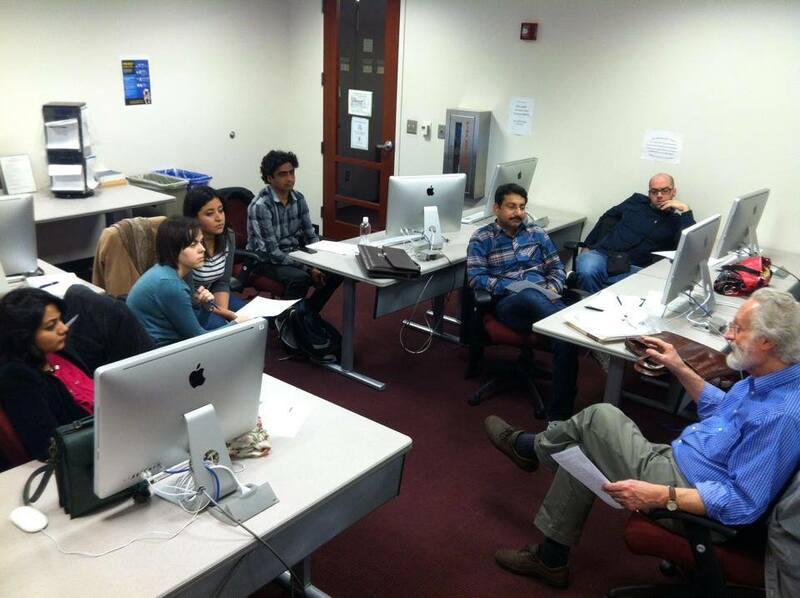 Weaver was a trainer for the Alfred Friendly Fellowship and helped journalists from more than 80 different countries adapt to living and working in the United States from 1984 to 2016. Alfred Friendly Jr., the eldest son of the program’s founder and a former leader of the program, said they’ve always encouraged fellows to share lessons they learned with colleagues back home. During the panel, the fellows addressed various cultural impressions they learned or dispelled during their 6-month experiences in the U.S. — ranging from how American news values compare to those from home to one fellow being given a bulletproof vest from a worried relative before his departure. Veengas Yasmeen, a sub-editor and writer for the Daily Ibrat in Karachi, Pakistan, worked at the Columbia Missourian during her fellowship. Yasmeen reflected on the new skills she gained and thanked her mentors for their support throughout the fellowship. Ashley Lime, a sub-editor for The Standard in Nairobi, Kenya, worked at the St. Louis Post-Dispatch during her fellowship. Lime discussed some of the most important lessons she learned. Salman Yousafzai, a reporter for The Frontier Post in Peshawar, Pakistan, worked at Minneapolis’s Star Tribune during his fellowship. Yousafzai compared his experience in an American newsroom to being a journalist in Pakistan. Nicholas Cheng, a reporter for Star Media Group in Petaling Jaya, Malaysia, worked at the San Fransisco Chronicle and the Los Angeles Times during his fellowship. Cheng discussed his experiences with censorship as a reporter in Malaysia. Cheng also reflected about the political atmosphere in the U.S. and some misconceptions he had about Trump supporters before he came to the country. Yasmeen also reflected on some of the misconceptions she had about the U.S. before her fellowship, including the amount of coverage regional papers give to international news. Smitha Rajan, an assistant editor at Daily News and Analysis in Ahmedabad, India, worked at Poltifact and the Pittsburgh Post-Gazette during her fellowship. Rajan was surprised by the diversity in American newsrooms. Cheng also described some of his and his family’s ideas about America before his fellowship — sharing a story about a kind, if misguided, gift from his uncle: A bulletproof vest.